Geiger Engineering electric motors, components, and even props are offered. 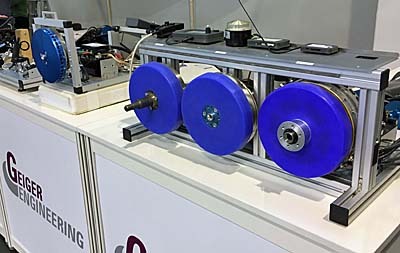 Many of the exhibited motors are for very light applications such as light-weight shift control trikes or gliders but motors are becoming more powerful. With an increase in power, new technical problems need to become overcome. For example, the larger the power capability of the motor, the more cooling is required for the motor. Smaller motors are mostly air-cooled, but some of the medium and larger motors require liquid cooling. This doesn’t mean that the motors have radiators, but liquid is built into the motor to help wick heat away from hot spots that are created when electricity is converted to mechanical power. Essentially we find three components to electrical power systems: (1) the motor itself, (2) batteries, and (3) a controller. The controller makes sure that the proper amount of electricity is delivered to the motor. Most of the electric motor developers are also developing controllers for their motors since the two work with each other so closely. Some companies, such as the German company Geiger, are offering complete systems from batteries to motor, and sometimes even propellers. A smaller German company, Qinetix, has integrated the controller with the motor, easing the task of airframe makers. Another German company, Qinetix, is not only developing a motor and controller but is placing the controller inside the case along with the engine. It means that aircraft builders only have to mount the motor and run power leads to it. The QPD-40 is an integrated system that is actually designed to be an electric replacement for the now-discontinued but once very popular Rotax 503 two-stroke engine. The designer explained that he had a trike with that engine and wanted the replacement for himself. He figured others would want it, too. The motor is still being tested and should be available later this year. Electric aircraft may still have minuscule market share but innovations could change that in the near future. 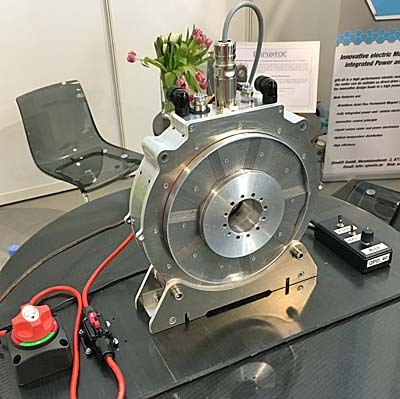 As Aero correspondent, Roy Beisswenger wrote, “This is a rapidly changing technology with both motors and applications showing up all over Aero Friedrichshafen.” This year Aero management concentrated them in one of the big halls where small startups to the heavyweights were located. Thanks to Roy for several reports from Aero, of which this is one. —DJ Many of the exhibited motors are for very light applications such as light-weight shift control trikes or gliders but motors are becoming more powerful. With an increase in power, new technical problems need to become overcome. For example, the larger the power capability of the motor, the more cooling is required for the motor. Smaller motors are mostly air-cooled, but some of the medium and larger motors require liquid cooling. This doesn’t mean that the motors have radiators, but liquid is built into the motor to help wick heat away from hot spots that are created when electricity is converted to mechanical power. People here at Sun ‘n Fun have been asking questions about Flight Design as the company has no exhibitor presence. However, the popular CTLS can be seen at the AeroJones Americas space. Why is this the case? On duty at Aero, reporter (and publisher of Powered Sport Flying magazine) Roy Beisswenger provided the following report. —DJ At the press conference for Flight Design president Matthias Betsch began the presentation explaining the company’s current situation. As many who follow the industry know, Flight Design has had their share of financial problems. The company is operating more or less as usual, but is in court-ordered receivership. That means many decisions the company makes need to be approved by the receiver. Fortunately, the situation is reportedly more stable than some speculate. Official and creditors want the business to remain viable by producing, selling, and supporting primary products. However, projects in development may not always survive scrutiny. SkyRunner has evolved significantly. The current version is on the left; the original prototype is on the right. Size, seating, power plants, instrumentation, wing, chassis... nothing is the same. I have been actively following SkyRunner for more than a year. The U.S. start-up company is rare in the Light-Sport world. The company's MK 3.2 entry is the first American two-seat powered parachute manufacturer to launch since the LSA regulation was issued. Sadly, the SP/LSA rules actually ran most of the powered parachute manufacturers, dealers, instructors, and even pilots from the early 2000s out of the business and sport. It is refreshing to watch a company buck that trend! Creating a powered parachute from the ground up is a challenge, and to build one that doubles as mighty gnarly all-terrain vehicle is even more of a challenge. SkyRunner's team did it more than once. They began their effort with a single-place model (photo) that owner and developer Stewart Hamel initially funded. The single-place edition was designed and prototyped in the United Kingdom and was to be sold here in the USA. Hamel quickly found that the market was less interested in that aircraft and more interested in a two-place version of the powered parachute. For that and other business reasons, he brought the design work from the UK to his home town of Shreveport, Louisiana and took a more hands-on approach to development. Features for the powered parachute were essentially "crowdsourced" with SkyRunner listening closely to what potential customers wanted. Then the military got wind of it because of its potential as a special operations platform. However, the list of features that the military was interested in was more than the typical civilian's "roll out, warm up, take off, and fly" mission profile. What special forces operators really wanted was an aircraft that can fly, but also act as a ground tactical vehicle. They also wanted it to be multi-terrain. They wanted more payload. Since the goal was to take the aircraft into battle (or even deep behind the battle), they wanted reliability. SkyRunner MK 3.2 delivers! Satisfying the military and first-responder wish lists makes the SkyRunner an aircraft that appeals to adventurous civilians, too. So instead of turning his focus to a "government only" design, Hamel worked from the outset to make a product that also conforms to the FAA's SLSA standards. SLSA regs — and a weight exemption similar to ones issued for the Terrafugia and Maverick flying cars — make it possible to offer the SkyRunner to the public. While new to manufacturing, and certainly to aircraft manufacturing, Stewart is not new to business or parachutes. He was involved in successful startup companies in the past such as ReachLocal (once a $800 million company), he understood business fundamentals well. When I visited his facility early in 2015, I was very impressed. The factory he was in was absolutely huge, being an old AT&T pay phone factory. Instead of renting the whole space, though, he only leased and fenced off a tiny fraction of the cavernous facility. 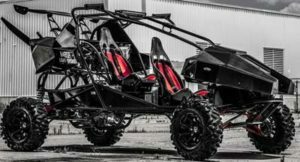 As production ramps up, SkyRunner won't have to move. Stewart will simply lease more floor space and move the fence. Getting their pink Special Airworthiness Certificate. Shown are Stewart Hamel, CEO & Founder; Doug Leinberger FAA Air Safety Investigator from the Ft. Worth MIDO; and, Cody Lackey, Director of Production for SkyRunner. Stewart's experience under canopies came from skydiving. Once an avid jumper, a bad accident and injuries in the sport prompted his doctors to encourage a new hobby. After some looking around, Hamel found powered parachutes and pursued his new sport with a passion. One of the lessons learned during the development process was what to build in-house and what to outsource. Initially Stewart wanted to outsource all he could and do only final assembly at his facility. During the prototyping and development work, he found that it was easier to control quality and get things done faster if he did more work in-house. Now with initial development complete, current plans now are back to only to doing the final assembly at their Shreveport facility. "We are having the welded chassis and wiring harnesses outsourced," Hamel said. "For final assembly, a team of four can complete eight to ten SkyRunners per month," he added. "That makes production scalable. As we grow, we can bring in additional teams of four to increase production." 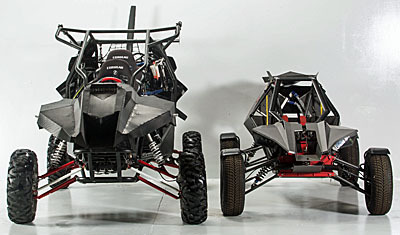 Even without a wing above, SkyRunner is one gnarly, exciting machine, an ATV on steroids. Any pilot (or ATV enthusiast) wonders how SkyRunner performs. This is actually two questions since MK 3.2 is both ground vehicle and aircraft. I only have experience with it on the ground, and I have to say that it is a thrill ride. With its wide wheelbase, light weight, and Polaris motor, SkyRunner will go places and do things that you'd never try with normal ATVs. Yes, you read that right. It has a dedicated Polaris motor for ground operations, making it an off-road bandit. SkyRunner also has a Rotax 912. As a powered parachute MK 3.2 takes off like any other powered parachute, only easier. Four wheels, that wide wheel base, and a low center of gravity combine to make the SkyRunner almost immune to tipping over. It also seems that the ground motor could also have a function for takeoff. Kiting (getting the parachute inflated and above the chassis) is one of the most challenging tasks for the new powered parachute pilot. Kiting in light and variable wind is even more of a challenge. If the wing comes up crooked or slides to one side, the parachute lines or risers could get caught in a spinning prop. Let it go too far and you can tip some powered parachute carriages. With a separate ground engine, a pilot wouldn't have to turn a prop to roll forward enough to kite the parachute. As the wing rises, the four-wheeled cart can handle most any odd kiting weirdness, and when you are happy that the wing is where it belongs, you can start the prop engine for actual take-off and climb. This isn't the official text book takeoff procedure, but it appears to hold promise. Now with the their newly awarded SLSA airworthiness certificate, SkyRunner is kicking things into high gear. While it hasn't been a secret that they exist, they haven't aggressively promoted their product to the aviation community... yet. Nonetheless, they have delivered a couple aircraft overseas to impatient customers while working through FAA paperwork. With the design settled and the production facility in place, deliveries are going to start taking place in the U.S. The approved design is now something that the military and other agencies can test and see if it suits their purposes. Expect to see a lot more out of this company this summer and in the future. Congratulations to Stewart Hamel and his entire crew! 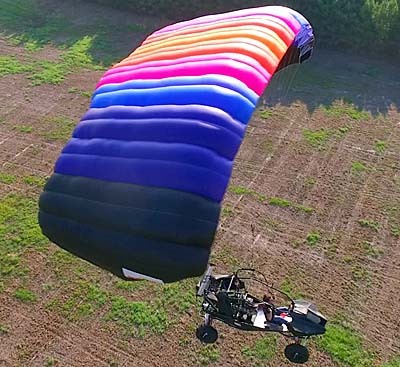 Please again welcome Powered Sport Flying publisher, Roy Beisswenger, who sent the following story on the exciting new powered parachute from SkyRunner. —DJ I have been actively following SkyRunner for more than a year. The U.S. start-up company is rare in the Light-Sport world. The company’s MK 3.2 entry is the first American two-seat powered parachute manufacturer to launch since the LSA regulation was issued. Sadly, the SP/LSA rules actually ran most of the powered parachute manufacturers, dealers, instructors, and even pilots from the early 2000s out of the business and sport. It is refreshing to watch a company buck that trend! Creating a powered parachute from the ground up is a challenge, and to build one that doubles as mighty gnarly all-terrain vehicle is even more of a challenge. SkyRunner’s team did it more than once. They began their effort with a single-place model (photo) that owner and developer Stewart Hamel initially funded. The new American Ranger 1 in flight. photo by Roy Beisswenger of Power Sport Flying magazine. A selection of the gyroplanes on the ramp at the Wauchula Airport. photo by Roy Beisswenger of Power Sport Flying magazine. Bob Snyder with Autogyro USA's naked MTO. photo by Roy Beisswenger of Powered Sport Flying magazine. Sun 'n Fun will feature a good selection of gyroplanes including this new-to-Americans Eclipse G10 offered by Aerotrek. Welcome to a guest editorial by Roy Beisswenger, publisher of Powered Sport Flying magazine and a close follower of the gyroplane scene. —DJ Bensen Days in Wauchula, Florida is our annual pre-game party leading up to Sun 'n Fun. The Sunstate Wing & Rotorcraft Club schedules this annual soiree to coincide with Sun 'n Fun. By holding their fly-in one week before SnF, they make it possible for vendors and participants to get a two-for-one deal. One trip south gets them two great sport aviation events. The scheduling certainly makes it possible for Vickie and me to participate. 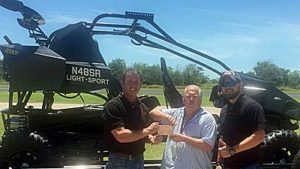 Gyroplane organizations are not the huge organizations that we see sponsoring major events like Sun 'n Fun and AirVenture. There is no paid staff and no big budget. The volunteers that put it together collect fees and donations to cover their expenses and build up the kitty for the next event. That is why it is such a pleasure to see an event like Bensen Days continue on year after year. It says a lot about the gyronauts in Florida! Anyone who shows up gets a lot of bang for the small number of bucks it takes to participate. Want to go for a flight in a gyroplane? This event gives you several choices and little to no waiting. Want to talk about gyroplanes? Try talking about anything but gyroplanes! Want to see what is new? Because this is the first major gyro event of the year and the scheduling proximity to Sun 'n Fun, you will often see things here first. Named after famed gyro pioneer Igor Benson, Bensen Days gives people a chance to visit with vendors and pilots in the home-built market who don't make it to the larger fly-ins. These participants are just as enthusiastic as the newer, Euro-gyro owners, but they don't have the budgets to attend the larger events. Some of the vendors I saw there included importers or manufacturers for Titanium Explorer, Dominator, Ela, Autogyro, Xenon and SliverLight Aviation. In fact Abid Farooqui officially introduced his American Ranger 1 gyroplane at the event. 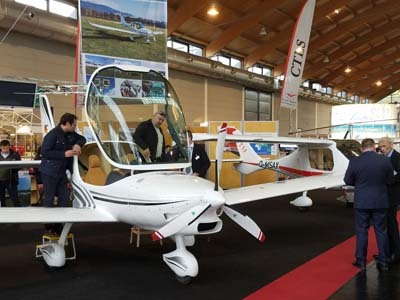 The gyroplane is going to be one of the first European-style gyroplanes designed and manufactured in the United States. The breezy day didn't stop the flying. Light airplanes could handle the winds, but they were quite a handful for the plane I saw take to the sky. The gyroplane pilots were aware of the wind, but had no problem with it. One of the interesting designs I saw at the event was a 'naked' MTO Sport. It is 'naked' because it has none of the normal fuselage panels — nose cone, the floor, and integrated composite shell. Instrumentation for the aircraft is contained in small nose pod. 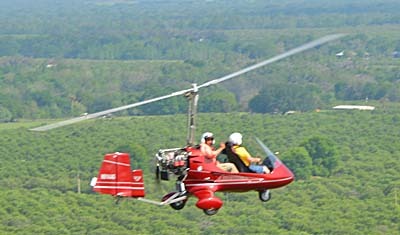 Autogyro representative Bob Snyder offered a flight in this unique version of their MTO. On a nice, warm Florida day, my short-sleeved shirt was just fine for the open-cockpit flight. I emptied my pockets of droppable stuff and stripped my camera down to the basic frame and lens for the flight. After a quick introduction to the aircraft, I had to ask a somewhat embarrassing question, "How do you get in?" Most gyroplanes have some structure to use when entering, but this MTO had no floor. It stands up high on some tundra tires. Answer: Just throw your leg over the seat and slide on up. I'm glad I'm taller than average. It's like mounting a short horse without the benefit of a saddle horn! Once aboard, the taxi to the end of the runway took very little time and Bob got us quickly into the sky. What a blast! All open cockpit aircraft remind me a little of a flying motorcycle, but this one really fit the definition. I was seated in a more comfortable seat than on a bike and had on a seat belt and shoulder harness, but everything else was incredibly open. Bob gave me the full familiarization flight. He showed me the capabilities of the gyro in the practice area next to the airport and over the cattle. Then he asked me if I wanted to see some alligators. Being from the Midwest, those animals always fascinate me. We went off to the phosphate mine ponds and saw some monsters, along with other wildlife. Welcome to a guest editorial by Roy Beisswenger, publisher of Powered Sport Flying magazine and a close follower of the gyroplane scene. —DJ Bensen Days in Wauchula, Florida is our annual pre-game party leading up to Sun ‘n Fun. The Sunstate Wing & Rotorcraft Club schedules this annual soiree to coincide with Sun ‘n Fun. By holding their fly-in one week before SnF, they make it possible for vendors and participants to get a two-for-one deal. One trip south gets them two great sport aviation events. The scheduling certainly makes it possible for Vickie and me to participate. Gyroplane organizations are not the huge organizations that we see sponsoring major events like Sun ‘n Fun and AirVenture. There is no paid staff and no big budget. The volunteers that put it together collect fees and donations to cover their expenses and build up the kitty for the next event. Aloft over Sebring 2014 in the I-TEC Maverick. Author Roy Beisswenger occupies the rear seat. 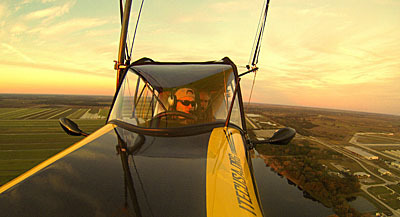 Maverick uses a T-bar support with a long carbon fiber mast holding the parachute when on the ground and a lateral cross bar to better support the flexible wing. Maverick comes in for a touchdown on its four, road-worthy wheels. Whizzing around the grounds at Sebring, Maverick shows its land vehicle prowess. Two persons can sit in the rear when Maverick is a car; one one sits aft when it flies as an LSA. Seen in the rear are author Roy Beisswenger and magazine editor Vickie Betts. Special thanks to Roy Beisswenger for this first-impressions report on the I-TEC Maverick. It is part of a comprehensive story Roy prepared for Sebring 2014 that will be coming soon in the February issue of Powered Sport Flying! Roy is a highly experienced powered parachute pilot, instructor, and Designated Pilot examiner. He is also gaining experience in gyroplanes — both types of aircraft are primary subjects of the magazine he publishes with Vickie Betts. Roy begins ... I have to admit that I thought that climbing into the back seat of the Maverick flying car would be a fun and OK experience. I really didn't expect it to be much more than fun and OK, though. Granted, I'm in a regular auto-like seat (worse, the back seat) and I'm flying. I can't see the wing anywhere. Oh well, like that hasn't happened before. After all, having been a powered parachute pilot for a couple of decades and a gyroplane pilot for several months, I'm completely used to not seeing a wing on my aircraft. One wing is high enough up that I forget about it and the other is moving so fast that I can't see any part of it after takeoff. So the car leaping into the sky with no visible means of support shouldn't have been that surprising. Maybe part of the problem was that I was jonesing a little bit for some sky. I hadn't been up even commercially for a few months. Still, there was something about taking off in the Maverick that was a great deal of fun. First of all, it was remarkably effortless. Even if I'm just doing a check ride or training someone in a powered parachute, it is always a hectic first minute getting the chute kited, centered, and ready for takeoff. Even a gyroplane has a handful of levers, releases, and things to monitor to turn a couple of thin blades into a serviceable wing. As an over-trained passenger, I'm always living acutely through the efforts that others are putting into their takeoffs. With the Maverick, the parachute is already overhead and ready to go. You can tell that plenty of effort went into the parachute deployment system. A carbon fiber mast with sailboat rigging technology are involved plus a little bit of bathroom technology. The actual parachute hangers (photo) remind one of hooks on a shower curtain. I-TEC's effort on the mast system really works. The Maverick sits on the runway without any worries that the wind will tip it over before the pilot is ready or even sitting in it. When it is time to go, the takeoff is effortless and casual. I-TEC pilot Troy Townsend looked up to check the parachute before adding power. I couldn't share that experience because I was in the back seat and all I had to look at above me was canvas located several inches away instead of Lexan and zero porosity fabric several feet away. This also counts as the first time I've ever flown in even a semi-enclosed powered parachute. That enclosure was certainly appreciated in the cool evening since I wasn't wearing anything more than I was wearing the rest of the day. The other big aesthetic differences had to do with the Maverick really being a car. It looks like a dune buggy on the inside with a tubing structure, canvas covering, steering wheel and two huge road-worthy tires visible in front outside the door on either side. Unfortunately, the sun was getting low and I was the last fly of the day. It really was a great taste of future possibilities of the car flying kind. On the ground with the parachute stowed, Vickie jumped in with me (it is a three-seat "car," after all) and Troy drove us around to get a feel for its dunebuggyness. It is a hoot on the ground, too. I-TEC is the Dunnellon, Florida company that developed the Maverick for mission work in countries with very poor road systems. The purpose-built vehicle works well off-road and really-off-road. That also makes it ideal for recreation. Special thanks to Roy Beisswenger for this first-impressions report on the I-TEC Maverick. It is part of a comprehensive story Roy prepared for Sebring 2014 that will be coming soon in the February issue of Powered Sport Flying! Roy is a highly experienced powered parachute pilot, instructor, and Designated Pilot examiner. He is also gaining experience in gyroplanes — both types of aircraft are primary subjects of the magazine he publishes with Vickie Betts. Roy begins … I have to admit that I thought that climbing into the back seat of the Maverick flying car would be a fun and OK experience. I really didn’t expect it to be much more than fun and OK, though. Granted, I’m in a regular auto-like seat (worse, the back seat) and I’m flying. I can’t see the wing anywhere. Oh well, like that hasn’t happened before. After all, having been a powered parachute pilot for a couple of decades and a gyroplane pilot for several months, I’m completely used to not seeing a wing on my aircraft. Coming from a long aviation tradition, Laurent is the son of famed French pilot, designer, and manufacturer Gerard Thevenot. "LAMA Mama" Randee Laskewitz remembers holding Laurent as a baby. New ByDanJohnson.com blogger Roy Beisswenger. The Aviator Airbag System was introduced to America at the Evolution Trikes booth at the Sebring LSA Expo 2012 courtesy of Laurent Thevenot. Designed and manufactured for La Mouette in France by Helite, the complete system includes two airbags and sensors. For trikes, two different airbags are recommended. For the person in the back seat, the smaller vest (photo) is enough to protect the passenger's head from snapping forward too quickly or too far in a crash, thereby preventing neck injuries. *** For the person in the front seat, a larger jacket is recommended. 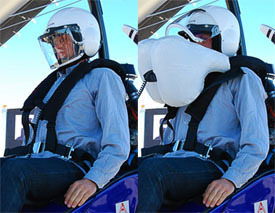 It also protects the wearer from neck injuries, but go further by protecting the pilot from the control bar, which could come rearward in a violent impact and break the pilot's ribs. The larger jacket expands to 40 gallons of volume. *** The system uses a patented cold gas technology, unlike typical hot gas technology used in other airbag systems. It deploys very quickly, in just a tenth of a second. The system was originally designed for horseback and motorcycle riding and has recently been modified for aviation. Despite its appearance as a life jacket, the vest is not watertight and should not be depended on as a flotation device if you are flying over water. *** The system is advertised to take only five minutes to install on a trike or other aircraft. It can be powered by the aircraft's 12-volt system or it can be independently powered by a small 9-volt battery. Powering it independently allows you to move the system from aircraft to aircraft a little easier. This is another significant contrast from the much-more expensive systems sold in general aviation airplanes; those are permanently mounted. *** The entire system of two airbags with G-force and attitude sensors weighs 4.1 pounds. In yet another clear advantage, it can be repacked by the owner in case it is deployed. Otherwise maintenance includes a visual check of the electrical contacts and the sealed high pressure gas cartridge for corrosion and leakage. *** Abid Farooqui, long associated with Evolution Trikes, said to look for the product to become available this May. They are accepting orders now for the product. The complete system is $2,345, although you can save a little by getting just one vest. While his new enterprise takes form, contact Abid at 813-786-8290. About Roy — You probably already know Roy, or at least you've probably heard him. For more than a decade Roy has been producer of the UltraFlight, later Powered Sport Flying Radio Show. He also publishes a magazine of the same name dedicated to "Aviation for the Rest of Us." ByDanJohnson.com is proud to have another talented writer like Roy join our editorial staff. Roy's incredibly close contact with the recreational aircraft community will help us keep you well informed. The Aviator Airbag System was introduced to America at the Evolution Trikes booth at the Sebring LSA Expo 2012 courtesy of Laurent Thevenot. Designed and manufactured for La Mouette in France by Helite, the complete system includes two airbags and sensors. For trikes, two different airbags are recommended. For the person in the back seat, the smaller vest (photo) is enough to protect the passenger’s head from snapping forward too quickly or too far in a crash, thereby preventing neck injuries. *** For the person in the front seat, a larger jacket is recommended. It also protects the wearer from neck injuries, but go further by protecting the pilot from the control bar, which could come rearward in a violent impact and break the pilot’s ribs. The larger jacket expands to 40 gallons of volume. *** The system uses a patented cold gas technology, unlike typical hot gas technology used in other airbag systems.